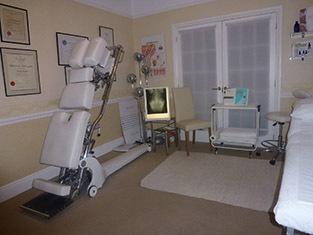 Acupuncturist, back and neck therapist and low level laser consultant in Bournemouth, Dorset. Our Back & Neck Clinic is based in Bournemouth but we also offer treatments to patients throughout Dorset including Poole and Christchurch. We can help relieve symptoms for individuals with musculo-skeletal disorders such as back or neck pain as well as those suffering from sports injuries, in particular ligament & tendon strains. Dr Hamblett has a Diploma in Osteopathy and many years’ experience. Our Bournemouth based clinic is fully insured. You can call us for a FREE telephone consultation where we can discuss your options for treatments. After your consultation we will be able to recommend a session or series of treatments at our Bournemouth clinic that fit in with your schedule. Dr Hamblett uses a method of manual treatment. He uses his hands to investigate the underlying causes of pain, allowing him to carry out treatment using a variety of manipulative techniques. It is likely that these treatments will include muscle and connective tissue techniques, rhythmic joint movements or thrust techniques to improve the range of movement in a joint, thus reducing pain. Our Back and Neck Clinic may use gentle releasing techniques, particularly when treating children & elderly patients. If you think you may benefit from treatment why not visit us at our Bournemouth clinic today? At our Clinic in Bournemouth we treat a wide range of physical conditions such as: Slipped disc, Arthritis, Low back pain, Sciatica, Neck pain, Frozen shoulder, Tension Headaches , Hip, Knee, Ankle, Foot pain, Sports Injuries, Tennis Elbow & Migraines. Dr Hamblett’s aim is to treat the cause of the problem and not just the symptoms. For example, someone who has pain in the neck may have an imbalance in the pelvis that would alter spinal curvature and cause spinal muscle spasm. This could then manifest as neck pain, headaches or pins and needles down the arm. Without addressing the cause the symptoms may not improve. Can our clinic help you? Why not contact our Bournemouth clinic, even if you are based in Christchurch or Poole? After a full examination our experienced practitioner will know whether you are suitable for treatment or need referring for further investigation. The number of treatments required varies from patient to patient. For example, some low back conditions need only one or two treatments while others may take four or more. Degenerative conditions such as osteo-arthritis or repetitive strain problems may require regular treatment at monthly or quarterly intervals. Some patients may require appropriate exercise therapy. In other cases x-ray examination may be arranged. Our Bournemouth clinic has been established for many years. John Hamblett has been practising in his Bournemouth clinic for many years. He is a member of the British Medical Acupuncture Society. Specialising in body mechanics and sports injuries, he is also interested in nutrition and the effects that diet, lifestyle and exercise have on the health.